Do you have a room in your home or office that never quite warms up, no matter how high you crank up your heat? Maybe it’s the guest bedroom, the back bathroom, a work area in your garage, a home addition or an in-law apartment … a place that always seems to need an extra blanket or another sweater to feel pleasant? Space heaters can be a fire hazard and a new furnace is a big investment, but that doesn’t mean you need to suffer until spring. You deserve to feel comfortable throughout your home! We have a fast, easy and affordable fix for frosty rooms: an energy-efficient, direct vent wall furnace. These sleek, smart Rinnai appliances circulate consistent, cozy heat and require almost no maintenance. Wall furnaces can be installed quickly. These direct vent furnaces require no ductwork, so experienced Waltz & Sons technicians can have your new wall furnace up and running just one hour. Wall furnaces are safe. 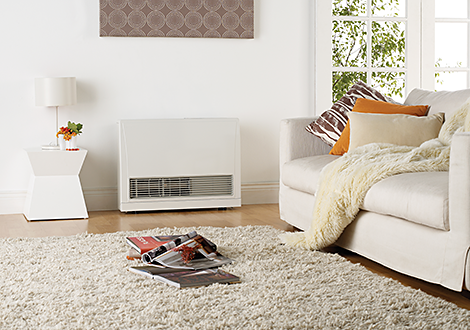 Unlike space heaters, wall furnaces aren’t considered fire hazards. And the cool-touch cabinet and control lock means you can let your children play close to your wall furnace with confidence. Wall furnaces are high efficiency heat sources. Each wall furnace continuously monitors the conditions in your room, generating heat only when you want it. You can pick your preferred heat setting and forget about it! Wall furnaces save hundreds of dollars per room, compared to other home heating options. A Rinnai wall furnace can turn a three-season porch into a year-round retreat. You can heat home additions, newly finished basements or bonus rooms and in-law apartments without creating a new heating zone. Wall furnaces also make great additions to guest rooms and AirBnB rentals—you can let your guests choose their preferred heating level without adding big bucks to your utility costs. We’ve relied on a direct vent wall furnace for our office heating right here at Waltz & Sons for years, and we still can’t believe how efficiently and effectively they heat our space. They’re durable and long-lasting, too. Our wall furnace is still going strong after twelve years! Give us a call or stop in to see how well it works (and how good it looks) for yourself.